The Dual Time Resonance Sapphire by Armin Strom is a horological masterpiece: a chef d’œuvre combining the practicality of two completely independent time indications with the increased precision of two independent movements in resonance. And all that in 360° display within a dazzling transparent sapphire crystal case. While Armin Strom is known for not covering their movements with a dial to highlight the horology within, this sapphire crystal case takes transparency to a whole new dimension. 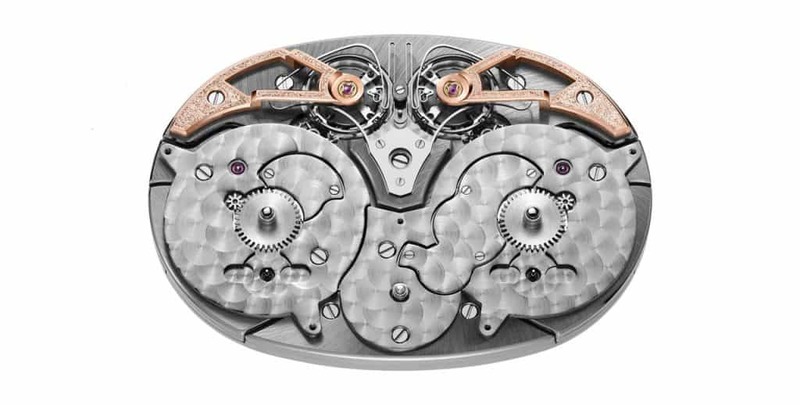 The oval shape is a logical outcome as the two watch movements are not vertically stacked but arranged side by side in this model. That defines the basic design of the Masterpiece 1 collection. Launched with the first Dual Time Resonance model in titanium, the Masterpiece collection has now been extended to include versions in white gold and 18 carat rose gold, each in a limited edition of just 8 pieces. Idependent movements enable the Dual Time Resonance to indicate GMT, or a second time zone, as well as a function used as a timer or countdown. Power reserve indicators on each of the hand-guilloche dials and a 24-hour indication at 6 o’clock complete the indications. While it has been long known that resonance in watch and clock movements with synchronized coupled oscillators improves accuracy by averaging slight differences in the precision of each movement and in wristwatches minimises adverse effects of shocks on precision. Less known is that resonance also conserves energy: vibrational energy that is normally be lost through the supports of the regulator is conserved in the system. 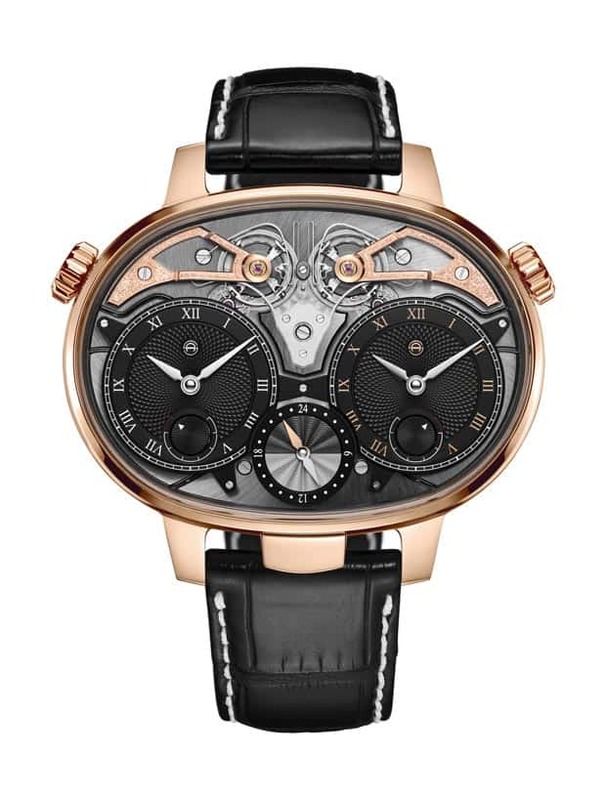 ‘Form follows function’ could have been written for the Dual Time Resonance: two movements side by side naturally led to the oval-shaped case, while the increased space afforded by the movements in this configuration allowed for two barrels per movement and a longer power reserve. Gazing through the display back at all four barrels winding simultaneously is as mesmerising as the ballet of the dual regulators on the dial.